Residents of South City apartments in Bengaluru were in for a rude shock this February when Bengaluru Electricity Supply Company Limited (BESCOM) served them a notice demanding penalties up to Rs 54 lakh. Similar notices were also sent to Purva Highlands apartment complex. The Vigilance Police Commissioner (BESCOM) from the Hosakote branch said that two months ago, a huge gated community on Doddaballapur Road, with over 3000 flats had everything from a spa, a beauty parlour, an ATM to Sewage Treatment Plants (STPs), fire hydrants and club house facilities on their apartment premises. Hence, it was charged under LT-5 tariff referred to for industrial uses, whereas the residents were paying electricity bills under LT-2a tariff meant for domestic purpose. This was considered to be misuse of the tariff guidelines according to the Karnataka Electricity Regulation Commission. (KERC). What did the notice to South City say? Residents of South City Apartments received a notice from the AEE at BESCOM’s Vigilance Department at the Ramanagar branch, informing them that they have been misusing electricity billed at LT 2 (a), a tariff meant for domestic consumers only. Since the apartment had been running an STP and fire protection equipment, they should have been billed at LT-5 tariff rates meant for industrial use. The notice cited Clause 42.02 under Conditions of Supply for Electricity and Distribution Licenses in Karnataka to underline the tariff misuse. A case had been registered by the vigilance department, it said. In February 2018, residents appealed to the KERC during their public hearing on BESCOM’s proposals for tariff revision. The revised tariff charges were published on May 14, 2018 on the KERC website. This revised policy clarified that the use of electricity for STP must be considered under domestic category LT 2(a) only. However, South City once again received a notice saying that the new policy applied only from the date of the revision (April 2018) and that they would have to pay up for misusing tariff limits from March 2017 to February 2018. To put an end for this once and for all, the Bangalore Apartment Federation (BAF) petitioned BESCOM to resolve the confusion over tariff categories. What was the final decision on the issue? During the meeting held on July 11 with all the officials involved, the BESCOM Managing Director Rajendra Cholan put all the confusion to rest. He clarified that KERC notification issued on 22/11/2016, in its eighth amendment stated that the rules for Recovery of Expenditure for Supply of Electricity was to be charged under Clause number: 3.1.1 (A). This clause specified that any commercial or industrial use of power in domestic complexes should be charged under LT 2(a) tariff only, as long as the connected load for such purposes is less than 25% of the total connected load of the domestic complex, including connected load of each apartment unit in the complex. Cholan instructed his engineers to withdraw the exorbitant penalties and charge the harassed residents under domestic tariff rates, specifically under the LT-2A category, after verifying that they have not exceeded 25% of the total connected load that is allowed for sub-activities such as ATMs, club houses, STPs and fire-hydrants. South City apartments having 1998 apartments has a total connected load of around 12000 KW of electricity. Only about 10% of this is for club house, fire pumps, STPs, and other common areas. The MD also clarified that the 2016 notification applies for the past period as well, asking them to withdraw the notice completely. Interestingly, residents also came to know that back-billing can be done for the past two years at the maximum, even as the BESCOM officials had informally told them earlier that they may have to pay a penalty for the last five years of alleged tariff misuse. The residents are now hoping for the MD’s instructions to be officially documented and communicated. South City Apartment Owners Association are waiting for another meeting with officials to formalize the previous meeting’s proceedings on record so that such confusion may be avoided in the future. Officials across BESCOM are informally aware of KERC’s recent amendments highlighting the tariff of apartments with STPs and fire-hydrants under LT-2A category. But the circular has not yet been sent to the departments and officials are waiting to be formally addressed for more clarity. What happens when there is genuine misuse of electricity? At the end of the meeting, BESCOM officials concluded that a case of Short Claim (which is the formal terminology used to denote the difference between the billed amounts for the sanctioned load and a different tariff used for penalization) could not be ruled. However, if there had indeed been a case of serious misuse, the residents would be charged under Section 135 under the Electricity Act, 2003. In such cases, only the consumer court can make a decision, unless BESCOM intervenes before the case reaches the Court. Why was BESCOM confused initially? The confusion goes back to previous tariff orders issued by KERC that categorised apartments or organisations with commercial facilities such as club houses, swimming pools, shopping complexes and Sewerage Treatment Plants under the HT-4 tariff, which is meant for heavy consumers of electricity. The outdated rules had not been revised for years. When Karnataka Electricity Regulatory Commission (KERC) was formed and the Karnataka Electricity Reform Act, 1999 was implemented, Bengaluru was still coming into its own as the Silicon City of India, hence the commission had not yet fully explored the idea of having STPs for domestic purposes. “The Conditions of Supply guide used by the vigilance section to determine penalties was formed by the Karnataka Electricity Board or KEB (which was eventually replaced by the KERC, formed under the Karnataka Electricity Reform Act, 1999) at a time when apartments did not exist in Bengaluru. The city had more independent houses and fewer industries then. This just had to be adapted for the present times, ” said a technical engineer on condition of anonymity. Even after it was agreed upon to move the tariff for these apartments from High Tensity (one connection for major bulks of electricity) to Low Tensity (several sub connections for smaller bulks), the charges to be imposed were still not clear. This time, the confusion arose because of the uncertainty over whether to charge them under LT-5 meant for industries with STP and firefighting equipment or under the LT-2 category meant for domestic use. Ironically, the notice was issued for using the same Sewage Treatment Plants (STPs) and fire hydrants that BESCOM itself had authorised and permitted to use under LT-2A (domestic). In 1998, when the South City apartments were constructed, they availed of the LT 2A Tariff during the meter installation, while the electricity charges for the STP built in 2006 was extended under the same domestic category. This is why it came as a shock, when BESCOM authorities, who had conducted routine inspections this February, said the usage of STPs should have fallen under the LT-5 tariff required for industrial activities with effluent treatment plants. 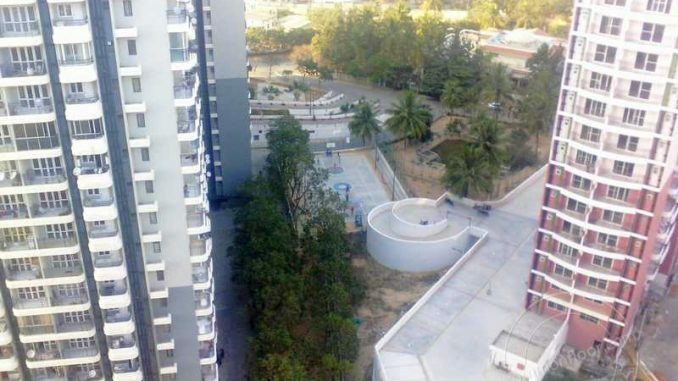 Rajagopalan, a member of the South City Owners Apartment Association said that South City apartments consume 5300 KW for lighting, water-pumping and lifts, and other common areas, costing Rs 12 lakh per month. Out of that, only 680 KW is consumed by the STP that is considered to be one of the biggest in the city inside a residential property. “If this was charged under the LT-5 category as the electricity board wanted, the bill would go up to Rs 15 lakh. Thus, the residents were asked to pay the difference of Rs 24-27 lakh from March 17, 2017 to February 2018. The difference was doubled up to penalize u sfor Rs 54 lakh,” said Rajagopalan. The electricity consumption for fire-hydrants is also negligible, he said. “The usage of fire-hydrants is rare, and is only tested out once in two weeks to make sure it works in an emergency. There is a difference between fire-fighting equipment and fire-extinguishers. The occasional testing is crucial due to the 20 storeys from ground up. It is fixed at a charge of 100 KW and it almost remains the same,” said Rajagopalan. The STP treats 8 lakh litres of water per day from which only 1,50,000 litres is used by the residents themselves, whereas the rest of the treated water is being pumped into Puttenahalli lake for the last two years, for the benefit of the public. “ I can easily approach the Lokayukta and High Court, and shut our STP down, because we are providing this facility free of cost to the public and BBMP. In that sense, they are actually doing a disservice to us for the good deed we are doing. In fact, after 2016, apartments need not build STPs where drainage facilities are available, as it is up to the BWSSB to provide us with water, ” Rajagopalan pointed out. house, yard/street lighting, canteen located within the colony. drinking water bottling plants and soda fountain units. The above table consists of only a few of the major categories the tariff applies to. The rest can be found on this link. Why isn’t there better communication between the different authorities? The vigilance section of BESCOM reports to the energy department, Government of Karnataka, and hence it becomes difficult for the BESCOM management to keep a check on their activities. They carry out investigations on their own along with an AEE who works with them full-time, and have police commissioners who can file cases of electricity theft and misuse. The officers, however, can seek clarifications from BESCOM’s main offices on their findings, but on their own the electricity board does not have the bandwidth. “It is impossible to monitor 67 lakh domestic connections in the entire city, we do conduct routine check ups to check the if the sanctioned load is followed, and if we find something amiss, we might take action. BESCOM acts as a special judge, re-looks into these orders if passed, and challenges them when necessary,” said a senior official under the condition of anonymity. On the other hand, vigilance officials say they only look at tariff orders given by KERC as the letter of the law to implement rules. When asked about the relationship between BESCOM and KERC, Safi Ullah Khan, Director ( Tariff) of KERC, said that there is no relationship as such. We are the regulatory body in charge and it is their call how they choose to follow us. According to Khan, how BESCOM interprets and implements tariff charges formulated by KERC is entirely up to them. ”Our rules are clear.You need to ask them what went wrong. There is no room for misinterpretation of the tariff guidelines and sometimes misunderstood tariffs simply need to be set right through grievance redress mechanisms without much media hype,” he said. 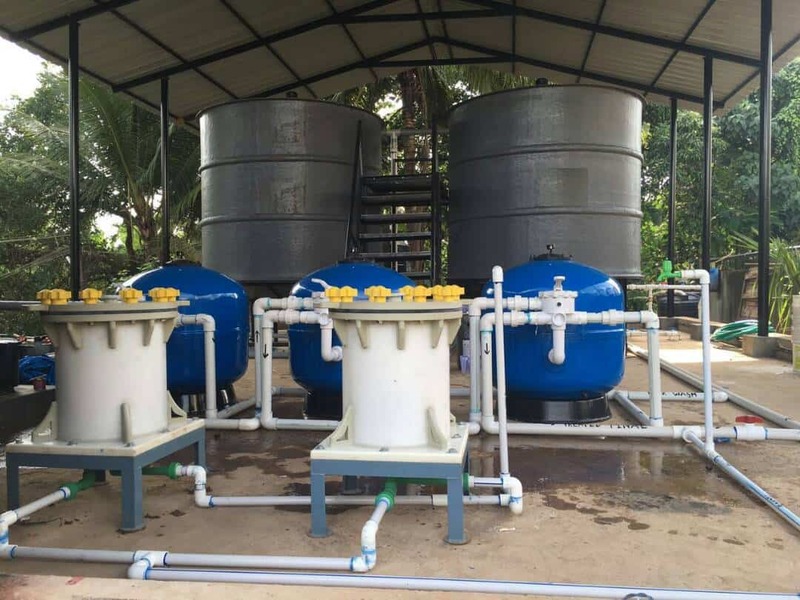 Is Bengaluru ready to drink treated sewage? With more and more apartments installing sewage treatment plants, recycled water is available for use. 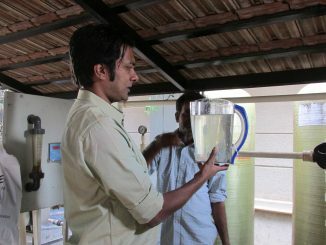 After RO treatment, this water becomes potable. But are people drinking it? 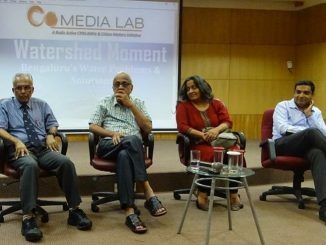 It has to be, ideally, a mix of both as recent deliberations at the water workshop co-organised by Citizen Matters revealed. On November 18th, managers of gated communities in Bangalore gathered to upgrade their knowledge on a variety of topics related to running of apartments and layouts.